With increasing number of companies, both small and large, depending on emails for most of their business conversations and marketing strategies, there is also found to be an increase in the number of email related attacks in the past few years. This article provides you few tips that can help you enhance the security of your emails. Firstly, always make sure all your data are encrypted. All the important business data, such as customer data, marketing strategies, client data, and much more, must be in an encrypted format when they remain on your company’s servers and also when they are being sent from one application to the other. This should also be done when those data are transferred from your company to a third party provider like your client or partner. Encryption is the best approach to maintain the security of your business data, especially when they are on the move as it is the time when data are extremely vulnerable. Next, set the databases apart from the internet. According to a recent report, cybercriminals have been found to abuse every accessible path, inclusive of security holes in mobile devices, malware, third-part snooping and phishing, to find a way into your database and capture all your valuable business data. Hence, it becomes extremely crucial to keep all the databases of your company away from access to the internet. Confine the amount of data you transfer over emails. Whenever you add email addresses to your emails, remember not to include more than the name and email address of the receiver. This can save you from losing your data than when you add all sorts of information like title, name, address, physical address, purchase history, or any other data that can be used to identify a person easily. Include in your email, only those data that are extremely essential for running your marketing campaign or those that are absolutely important for the record, in order to avoid data loss or theft. 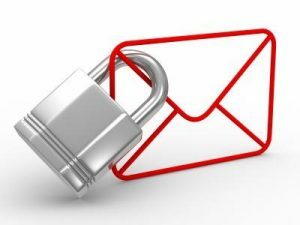 And last but definitely not the least, use the services of a Virtual Private Network (VPN) to improve the security of your email communications. For business purposes, you can use a remote access VPN that secures all your corporate resources by creating an encrypted tunnel over your internet connection. The universality of the internet, along with the different VPN technologies of today, enables businesses to extend their networks to any individual, in any location, and at any time, both securely and cost-effectively. In addition, a VPN increases flexibility and reduces the costs associated with communications, secures your email communications by providing the right to access to only certain individuals in your company, like specific contractors, employees and partners, and improves productivity by augmenting the corporate applications and networks.